Here's a classic column from the pages of Guitar World magazine. I always get frustrated when I hear someone talking about sweep arpeggios. Though there are plenty of licks and examples out there, no one has ever really broken down the mechanics of the technique. As a result, guitarists have had to figure them out by trial and error. This became all the more evident when I was teaching. My students repeatedly made the same mistake: they'd hold a barre chord while articulating each note. To play sweep arpeggios correctly, you have to mute each note with the left hand immediately after picking it. The best way to learn sweep picking is to first isolate the right- and left-hand techniques, master them separately and then coordinate them. Let's begin with the right hand. Basically, you have to let the pick "fall" from string to string as if you were strumming a chord. Don't try to separate the pick strokes! This technique feels weird at first, but picture your right hand as a Slinky going down from step to step-just let it fall. When executing an upstroke sweep, drag the pick upwards over the strings. Keep your hand loose and relaxed, as if it were being lifted by a string tied around your wrist. Now let's look at the left hand. 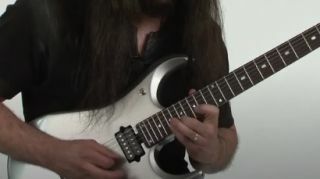 In order to use the sweeping technique, you can only play one note per string. As I noted earlier, you need to mute each string with the left hand immediately after picking it to keep the notes from "bleeding" into each other and sounding like an ordinary strummed chord. FIGURE 1 is an atonal-sound sweep picking exercise that is designed to coordinate you left-hand muting and right-hand sweeping techniques. Practice it slowly at first, concentrating on keeping the notes separate and distinct. Then try playing it faster. Muting the strings with the left hand can be difficult whenever two or more consecutive notes are on the same fret, as when sweeping a familiar barre chord shape. The key to muting the strings properly and keeping the notes separate when barring is using what's know as the rolling technique. Rolling involves fully extending your barring finger so that it becomes slightly arched. This is absolutely essential in order to make the technique work. If your fingers don't seem to want to bend backwards, you can work on increasing your flexibility by fully extending all your knuckles and pressing your opposite fingertips together gently. When performing this limbering exercise, be careful not to press too hard, as you could overextend your joints and injure them. Let's look at an example of the rolling technique, using a major triad shape on the D, G and B strings (Figure 2). In order to make the rolling technique work you'll need to fret the D string note with the tip of your finger, using the fleshy underside of the finger to fret the G- and B-string notes. To execute the first roll in Figure 2, pick the D string. Then, as you go to pick the G string, arch the first knuckle of your barring finger and roll the finger in the direction of the sweep, so that the tip of the finger mutes D string. As you pick the B string, continue rolling the finger to mute the G string. Done correctly, the notes will sound separate and distinct. When performing the descending (upstroke) sweeps in Figure 2, roll your barring finger in the opposite direction. Keep repeating the C and D triads in Figure 2 until you can sweep them quickly and cleanly. The rolling movement should be like that of a rocking chair. Practice rolling with all four fingers of your left hand. Once you master Figure 2, try FIGURE 3, which will help you gain left-hand facility across the fingerboard while sweep picking. Make sure you follow the right-hand picking pattern indicated above the tablature. It's tricky, but well worth the effort! As you coordinate the right-hand sweeping with the left-hand rolling and muting, you'll start to develop the speed and definition that makes sweep picking such an exciting technique. FIGURE 4 is a jazzy sounding lick that combine sweep picking, alternate picking, rolling and quick position shifting. The lick is just chromatically descending minor-sever arpeggios, but listen to how cool Ebm7 and Dbm7 sound over A7 altered and G7 altered, respectively. This lick sounds great when played with the sweep technique. Work on coordinating both hands. Proceed slowly at first and concentrate on maintaining a steady flow of 16th notes. Though it'll feel awkward at first, you'll be truly amazed how you'll sound when it clicks.